If you want to start exercising, according to calisthenics rules, you need to start from beginnings. We have prepared an exercise kit to help you shaping your body for the following season. In the article you will find exercises with helpful tips, how making them properly. Let’s get started. Our beginner exercise kit, we’re going to start from classic dips. The best solution will be to go to the gym with appropriate equipment. At first, you need to get into starting position. To do so, take your body at arm’s length with the arms closely locked above the bars. Then, take a breath and slowly lower your body to the bottom. Keep your chest upright and the elbows close to your body. Lower the body till the 90 degree angle formed between forearm and upper arm. Now, exhale and using your triceps, take your body back to previous position, take your chest back up. If it is your fist attempt, try to help you with the machines in the gym. It would be a good idea to ask a trainer how are they working. To make perfect push-up, put your hands beneath your shoulders to make a straight line between arms and wrists. Try to spread a bit your fingers, to make a good base for push-ups. Using your arms and core muscles, in average tempo, try to lower back to keep your body in one straight line. Remember to use your core body muscles to keep the body line but not tense. At the very moment, bend your elbows to prepare them for the following push up. Remember to hold them next to the body. Start lowering the weight smoothly, but keep control on the tempo. Then, lower your body to the moment, when the chest is a bit above the ground. Try to do not lay down on the floor and stay in that position for one or two seconds tops. Now push! Try to do the same thing on the other way around and remember to have control over the speed. The best tactic is to push the floor like you want to stand up. In the moment, when your arms are straightened out, pull your hands off the floor. This is a very crucial moment, because as much power you put on to take your hands off the ground, the higher your body will be floating and only at the very moment you will be able to make a clap and get back to first position. Traditional pull ups are one of the best exercises for every beginner workout program. All you need to perform pull up is a tree branch or a bar above your head. To perform a series of pull ups, stand steady on the ground and catch the bar by opened hands. Remember to put your hands in a bit wider distance than your shoulders. Now, hang on the bar with folded knees, exhale the air and bend your elbows to the moment when your chin will be touching the bar. You need to feel the moment, while you’re lifting up yourself to the bar, to push the body as strongly as you can, next to the bar. Remember about proper angle to do not harm yourself. When your body will be like floating for a while, make a clap, grasp the bar and get back to start position. At the beginning, will be hard to make more than ten clap pull ups, that is why try to make them on the lower bar with feet resting on the ground. The difference between simple pull ups and clap pull ups is only the lack of the clap. Doing a classic pull up requires a bar or tree bench. For the beginners is a good practice to start with lower bar. Additionally, to keep your body in the center, you can help yourself by crossing the feet beneath you as you lift yourself up. Making elbow lever requires strength, mobility and flexibility. To be able to do this exercise, you need to have properly strengthened wrists. If it is your first time with elbow lever, try to do some regular push-ups first, to prepare your body for increased effort. First, put your hands on the flat object like a bench or lower table. Keep your fingers in the face of your feet and your palms a few centimeters apart. Then, bend the elbows and try to curl your backs like you wanted to cover your chest. Now, move your arms to the area between your hip bones and torso. Try to bend forward and lean your knees like you have wanted to put the elbows against your stomach. In the end, try to tense abdomen and move your body weight forward to the point, when the feet lift up above the floor. It’s not the simplest exercise for beginners. The main problem arises when you want to put both elbows inside of the hips at the same time. If this is your first time with elbow lever, try to use only one arm, and the other one – move forward to hold the body weight. If you have quiet week arms and you want to put a little power in them, incline push-ups are perfect exercise. Thanks to putting your hands higher than the plain floor, you don’t have to use the full weight of your body. How to make incline push-ups? Firstly, put your hands on an object a bit higher than the ground – the park bench will be perfect. Then, place the hands a bit wider than the full width of the shoulders apart. Try to straighten your legs behind you and keep the toes on the floor or ground. Remember about keeping your body in a straight line, from the shoulders, through your hips and to the feet. Next, tighten your midsection by pulling the navel toward the spine. It is important to protect the backs and have an eye on the ground to have full control of your neck. Now, inhale the air and bend the elbows out to the sides and try to slowly lower your abdomen toward the bench. At the end, exhale and straighten the arms and come back to previous position. Bent knees raises is great exercise if you want to have a flat, muscled midsection. The best thing is all you need to have is some clean floor or simple mat. Excellent exercise for the beginners prepares untrained stomach for the following, more advanced workouts. What you need to do is lay on the floor and keep your arms alongside your sides. Then, bend the knees at 80-degree angle and put the feet off the ground by more less couple of centimeters. Now, try to bring the knees to yourself, using your lower abdominal muscles, and keep 80 degree angle bend in your legs. Keep forward with this movement to the point when your hips leave the floor by rolling basin backward. Remember about the breathing during the exercise. If you want to make proper bent knee raises, at the end of the exercise, keep your knees by your chest. At the moment, when the knees align your chest, try to squeeze your abs for a couple of seconds and return to start position. Depends on your form, repeat the movement around 20 times. It’s really hard to recognize any differences between diamond and regular push-ups, instead of the hand shape positioning. 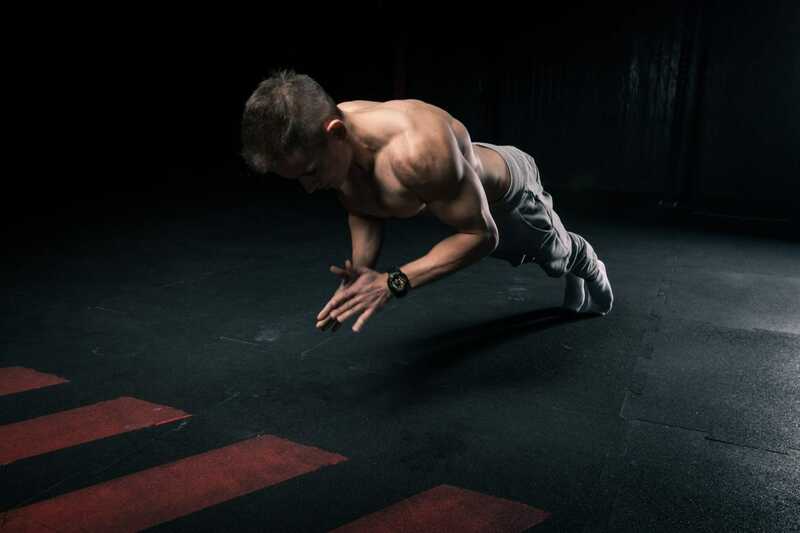 To make diamond push-ups you settle the same position like in regular push-ups, but instead of the positioning wider than the shoulder width, placing your hands in the position your thumbs and forefingers are sticking with each other. Still, diamond push-ups are extremely effective for triceps and chest in comparison to regular push-ups – they are harder to make. If you’ve ever been wondering, why military units are hard-trained in push-ups, here is the answer. The movement becomes a perfect answer for great-shaped arms and corpus. You will find a wild range of push-ups, depends on of the intensity level. To make explosive-push up, put your hands on the floor a bit wider than shoulder width. In terms of the breathing, exhale at the bottom of the push-up and inhale when you are at the top. Try to keep a straight line from your back and to your legs. Also, remember not to touch the ground by your chest and holding your eyes straight forward all the time during the movement. During straightening your arms, push your whole body as high as you can, using your hands and toes. After all, come back to the first position. If you want to work on the strength of your abs, one leg dragon fly is a good exercise to do so. Primary target of the movement is your upper back, forearm, core and triceps muscles. To make one leg dragon fly you will need workout bench and ankle weights. First, lay on the back on a workout bench. Remember about the putting top of your head at the end of the bench. Then, bend the knees and lay your feet flat on the bench. Brace your midsection and bend your hips. Meanwhile, pull the knees in toward your chest. In the same time, put tight with hands and put your hips and legs to the top. Now, try to bend only at the upper abdomen and middle backs as you straighten the hips and leg to get close your body to perpendicular to the ground as you can. Secondly, trim the knee 90 degrees and lay your thighs with your torso for the starting position. Try to slowly lower your feet to the bench, keeping in mind about not to bend the hips. Tuck the knee one more time and move your hips and leg to the first position and repeat the whole exercise. At the begging, start with ten reps tops for five series. After a couple of weeks, you can expand. 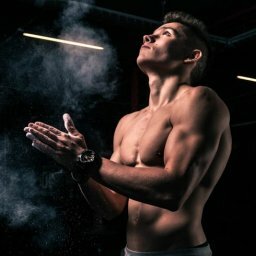 Calisthenics exercises for beginners contain basic movements known even from high school. A proper combination of all of them, practicing regularly, can make a huge difference in terms of your body presence. The most important thing to remember about is systematic and breathing. Also, to take full of exercises, try to eat well-balanced meals to reach satisfying results in a reasonable period of time.